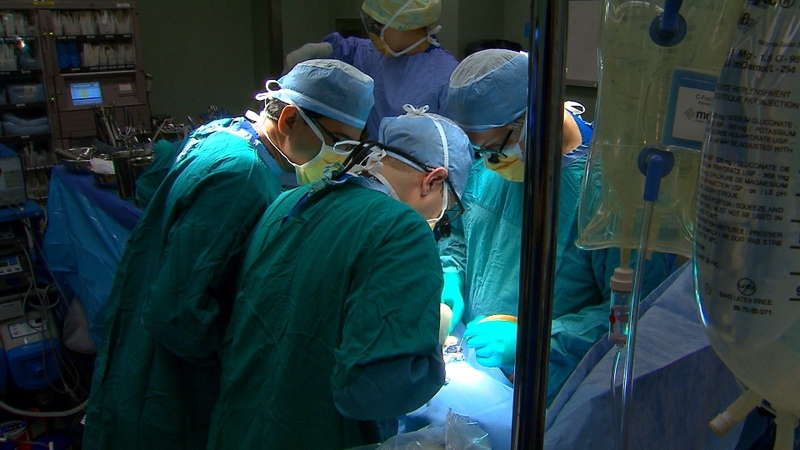 TORONTO -- In what's believed to be a world first, Canadian doctors say they were able to save a young mother's life with a radical procedure -- they removed her lungs. A group of Toronto doctors saved a dying woman's life by removing her diseased lungs to buy time for a transplant. "I didn't believe it," she said, recalling what her husband, Chris, and her parents told her after she regained consciousness. "It took me a while to realize what happened. I just couldn't piece it together." Still, that initial decision to remove her lungs -- the source of an antibiotic-resistant infection that had tipped her into widespread organ failure and septic shock -- wasn't taken lightly. "It was a difficult discussion because when we're talking about something that had never to our knowledge been done before, there were a lot of unknowns," said Dr. Niall Ferguson, head of critical care at the University Health Network, which includes Toronto General. "In Melissa's case, our hand was being forced a little bit because she was actively dying, and if we hadn't done something, she would have died that day for sure." Dr. Shaf Keshavjee, director of the lung transplant program, said the team weighed the pros and cons and presented the idea of the last-ditch procedure to her family -- and they immediately agreed. "She had made it very clear that she wants to live for her family, for her child, and to do anything -- experimental or not -- to give her a chance if we could do it," said Keshavjee, one of three thoracic surgeons among a 13-member surgical team who took part in the nine-hour operation to extricate Benoit's severely diseased lungs. The surgeon described each lung as being so heavy and rock-like, "we could barely pry it out of her chest." Benoit was put on two machines: a Novalung, which infused her blood with oxygen while removing carbon dioxide -- as the lungs do naturally -- and extracorporeal membrane oxygenation, or ECMO, that helped her heart pump the blood through her body. "And literally within minutes -- it was probably around 20 minutes after having taken those infected lungs out -- her blood pressure normalized and they could remove all the blood pressure-supporting drugs and just leave her on the pumps that were providing the circulation," Keshavjee said. "It proved the concept is successful, but how long could you support her in this condition?" he said, adding that the biggest uncertainly was how long it would take for replacement lungs to become available. "We didn't know if we'd get (them) in one day or one month ... So it was a day-to-day thing, and thankfully in about five to six days, we did get donor lungs offered that were her correct blood type and a reasonable size match, so we could go ahead with the transplant." "The only thing I could do was stick out my tongue," she said, and then only with the encouragement of her mother. "That was the only way I could get her to communicate with me," recalled Sue Dupuis. "I said: 'Please Melissa, if you can hear us, stick out your tongue.' And it took a good 20 minutes for that tongue to come out just a little bit ... You know, it's like a movie." "That was when I was, wow, I could breathe. I never had this feeling. I didn't cough anymore. When you have CF, you cough all the time," she said, dabbing away tears. "I never thought I'd do it again. I never thought I would walk. And here I am walking," she said, hugging her daughter Olivia. "You really come from the brink of death to back living at home. But I'm just so grateful, so happy to be home," said Benoit, who had to go on dialysis after her kidneys failed as a result of the sepsis. She hopes to be well enough for a transplant in the next few months, with her mother donating one of her kidneys. Today City TV News did a feature on my dad and his recovery. This is why we continue with this tournament. Trillium Gift of Life Network (TGLN) reports a record year for organ and tissue donation in Ontario in 2009. There were 218 organ donations that resulted in 691 life saving transplants for an increase of 17 percent over 2008. TGLN and it's partners of tissue banks, the 21 major donation hospitals and the transplant centers in Ontario worked hard to achieve this success and are to be congratulated for their dedication to organ and tissue donation. The increase in donation resulted in a nearly 24 per cent decrease in the number of deaths of people on the organ transplant waiting list. The tool Keshavjee had brought with him was essentially a mini heart-lung machine but in reverse. It permits the lung to stay at room temperature and function as usual — removing carbon dioxide from blood (a cellular solution, in this demonstration) and adding oxygen. When a human lung retrieved from a deceased donor is hooked up to the machine, physicians get the luxury of time to assess its condition and then treat it using targeted methods, including gene and cellular therapy, before transplanting it into the recipient. At that point, it’s become a “super organ,” as Keshavjee says. Using conventional methods, transplanted lungs are cooled to slow deterioration and then transplanted, with little time to assess their condition or repair damage. Keshavjee says this new method has allowed some 30 patients to receive donated and repaired lungs that wouldn’t have ordinarily been used.